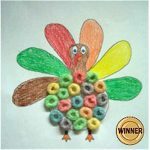 Crafters come in all ages and our newest contest winner is six year old Evan from Viera , Florida. Evan is a first grader and is a Lego-Maniac! He loves anything Star Wars and Boba Fett is his favorite Star Wars character. Evan also takes Fencing lessons as well as Parkour. Gather your materials. Anything that can be attached to a string and that will make a “chime” when hitting the other items can be used. Get enough pieces to string items evenly onto 4 string (we used five items per string). Use one piece of string to tie the Popsicle sticks together; we wrapped the string around the sticks in an “X” pattern several times and then tied it off on top. This make a big loop from which you will hang your finished wind chime. Next, string and tie your items onto each of the four lengths of string; make sure to leave enough string at the top so that you can tie them on your Popsicle sticks when you are ready and also space them so that the last sits toward the bottom of the string. Once you have attached your items, tie a string to each end of the Popsicle stick. We glued the strings into place with a dab of hot gue after tying them on the sticks to prevent them from sliding across or off of the stick; you could also use a small rubber band to hold them in place. IT’S A WINNER! Take a look at what one of our talented viewers submitted to share with you. 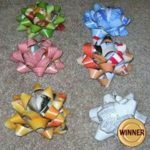 This craft was selected as one of this month’s winners to received $50 in craft supplies. Click here to find out how you can enter your original creation for our judges consideration.